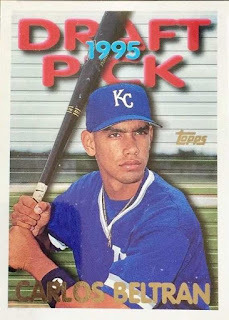 This rookie card was on my ‘holes to fill’ list and I randomly decided to finally pick a copy up for my PC - even though Beltran’s rookie card is messed up because it isn't his picture on the card. 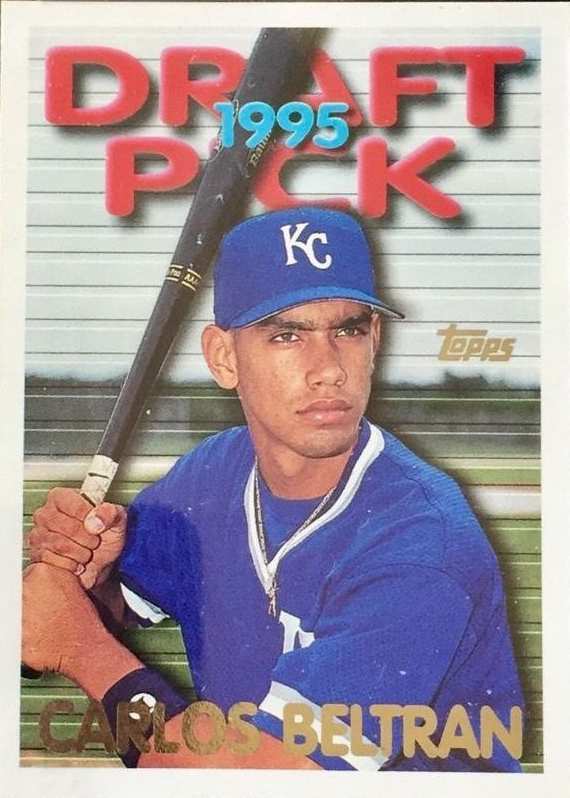 The card pictures Juan LeBron, who was the Kansas City Royals' first round pick [19th overall] in 1995, but failed to reach the major leagues - Beltran, who was the Royals’ second round pick [49th overall] from the same draft class is pictured on LeBron’s card, though the card listed with Beltran’s name / bio should still be the one that commands any interest [regardless of the goof]. After a player retires like Beltran did in 2017, there maybe an extended period of time where you are just out of sight, out of mind - though as a borderline Hall of Fame player, Beltran may gain support for his eventual induction in Cooperstown. When Pearce was named the 2018 World Series MVP, I had to dig this card from somewhere and was glad to find it relatively quickly among a brick of cards I'd organized for players involved in transactions in a particular year - I may remember watching an at-bat of his once in-person when he was with the Pittsburgh Pirates [in 2008 perhaps]. I thought he had a nice batting stance and perhaps the look of a guy who can put up some decent numbers - though didn't seem like a top prospect and hadn't really established himself at all in the major leagues. He has bounced around in his big league career and I guess the best thing I could say before this postseason - was he was a role player who had some pop in his bat and performed well at times in a platoon situation. I got this card from an autograph forum that once had these listings where you could use points you collected from commenting or otherwise helping someone out - the autograph [I assume it was from TTM request] isn't too bold and maybe exposure to the natural elements made it fade a bit faster. At times, I don't want to spend time playing with my cards so maybe it is a bit tedious to go through my cards one-by-one to see which subset they belong - does this new classification 'deal' complicate things or help 'stretch things out' as far as my interests in any one particular mini-collection, forcing me to do what I might not feel like doing. I have to worry about some overlap, but I feel like I can still play around to determine where my pulls or my finds go - I've started with my latest 'AA' adds and look to tag the cards featured on my sampler pages. The logistics in displaying sampler pages for my bloodlines collection was still up in the air - the main collection consists of miscellaneous cards of professional athletes [primarily baseball] who maybe have brothers, fathers, grandfathers, cousins, nephews play professionally as well. There are some ‘completed’ bloodlines connections within this sampler lot - but I feel like I'm lagging when I don’t have a card of an applicable card of a family member handy. A subject not represented among these sampler pages just means I have to go out and get the card - in my main collection, it isn’t a big deal to be missing a card that makes up part of a family chain, though for the more notable bloodlines, I need to get those missing cards in-hand. 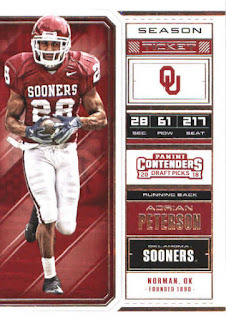 I wanted to make it where in most cases the cards for applicable bloodlines ties were shown side-by-side [for the most part] and used up 7 pages to display the cards I had in-hand - I tried to grab cards from various pro athlete families, though these sampler pages are not comprehensive. Acunas x2 - father Ronald Sr. and son Ronald Jr.
Alomars x2 - brothers Roberto and Sandy Alomar Jr.; missing a card for father Sandy Sr.
Bichettes x3 - father Dante and son Bo; missing a card for Dante Jr., who was once a prospect for the New York Yankees. 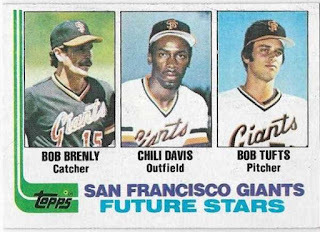 Bonds x2 - father Bobby and son Barry; missing a card for Bobby Jr., who was a career minor leaguer. Canos x2 - father Jose and son Robinson [on the back of his father's card]. Alou / Rojas x2 - Moises Alou and Mel Rojas [on the back of his cousin Moises' card]; if I understand it correctly, Rojas is the paternal name, but Alou ended up the most commonly used surname for the distinguished baseball family; missing cards of Moises’ father Felipe along with uncles Jesus and Matty. Boones x4 - grandfather Gus, father Bob, Bob’s sons Bret, Aaron and Matt [who didn't make it to the major leagues, but has a mainstream Bowman card from 2000]. Bretts x1 - George Brett; missing a card for brother Ken. Cansecos x2 - brothers Jose and Ozzie [on the back of his brother's card]. Cruz x3 - father Jose Sr., son Jose Jr. and Jose Sr.’s brother Hector; missing a Tommy Cruz card. Griffey x3 - father Ken Sr. and sons Ken Jr. and one-time minor leaguer Craig. Hoffman x2 - brothers Trevor and Glenn [on the back of his brother's card]. Guerreros x4 - father Vladimir., son Vlad Jr,. Vladimir's brother Wilton, Vladimir's cousin Cristian [longtime minor leaguer] and Vlad Jr.'s cousin Gabby [who made his MLB debut in 2018]. Millers x2 - brothers Darrell [MLB] and Reggie [NBA], missing a card for sister Cheryl [basketball] and Darrell Jr. [Topps put him on a 2018 Topps Heritage Minors leaders subset card]. Molinas x3 - brothers Bengie, Jose and Yadier. Rodriguez x1 - father Ivan and son Dereck [shown on dual sided insert card he shares with father]. Ripkens x4 - grandfather Cal Sr., sons Cal Jr. and Billy; Cal Jr’s son Ryan. Smiths x2 [not pictured - 10/29 add] - father Dwight and son Dwight Jr. I had to make a late afternoon run to get some Topps Updates at some card shop I stopped at - I’m looking for anything Juan Soto [note, didn't pull any] and took the plunge with two jumbo packs; I used to try to get a single jumbo pack of every Topps release, but I haven’t really done so in recent years. Maybe I could get a retail blaster box somewhere, but while it is a little different - I’d rather get something ‘hobby’ as far as roughly getting the same number of cards [but maybe a better chance of pulling something of note]. No pics, they are plastered all over eBay listings anyway - this took roughly five minutes [cut and paste from a Google Docs file where I list my pack breaks]. #US87 Joey Votto / Billy Hamilton - Thunder & Lightning; should have put Scooter Gennett and Votto together. Collecting autographs in-person or the idea of getting something signed is one of my last links to what I was doing when I was in my late teens - I would never, ever consider myself too old to get something signed by any person I could get an autograph from, though reality tells me otherwise. Maybe the opportunities are not there and/or are too commercialized to be as pure as getting a card or a ball signed at a spot like a ball game - but maybe as a nod to years I've spent literally chasing after signatures, I collect the cards picturing players 'inking it up' for fans. It maybe a random factoid, but I was able to get in-person autographs from 22 of the 27 players pictured on these group of cards, spanning about 30 years - I may have stories from the 22 guys I got autographs from, though I missed out on five guys as far as getting their autograph in-person. 1. Babe Ruth - obviously, though I was going for Lou Gehrig and neither one signed when the New York Yankees came into town one year. 2. Roberto Alomar - I've always seen him as a prima donna of sorts and the only time I'd ever remember him signing was when he was playing for the Cleveland Indians and on a night when I wasn't around. As the story retold to me goes, someone was heckling him after a game for perhaps ignoring fans on his way out of the ballpark - to shut the heckler up, Alomar proceeds to sign for everyone, but the individual who gave him a hard time. 3. Kirby Puckett - maybe forced to retire the year before I was graphing at my local big league park and my only apparent successes with are TTM. 4. John Smiley - mostly pitched in the National League, before Interleague play was a thing and I was really only getting my autographs at an American League ballpark when I first started. 5. Kim Batiste - I was more into cards when this junk wax era utility man was playing. I wanted continue seeing if I could display certain collecting subset cards in nine-pocket pages - as featured in previous posts on this blog over the summer, I started to make sampler pages of my favorite mini collections to see if I could put together a binder to flip through. With a new box of Ultra Pro pages, I wanted to add cards of my bloodlines, inking it up and multi-sport athletes collections as priorities - I put together 17 cards using one page as a snapshot of prominent pro athletes in one sport, yet might have been good enough to dabble in at least one other sport [high school / college / pros] at one point in their playing careers. 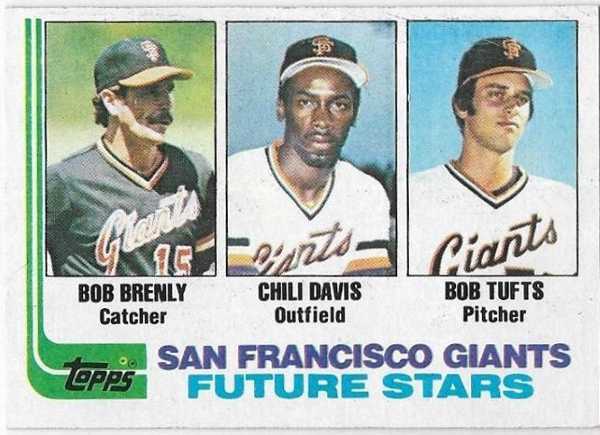 These cards were originally referred to as 'two-sport stars' collection, though in my collection, there are cards of players who simply forgettable - guys who may not have developed professionally in a sport they tried to play, like a baseball player who spends four or five years in the minors, but ends up going back to college to play football in anonymity. In my collecting life, it was Bo Jackson and Deion Sanders who made the idea of two-sport players a real attraction during the junk wax era - Jackson had all-world potential as a baseball player and maybe I saw Sanders as an ersatz version of Bo, maybe more flash than substance on a big league field. Looking at his stats, Sanders was actually decent MLB player, though the NFL was always the priority - as it goes, Neon Deion was the one who didn't get hurt [insert of some of tired tackling joke here] and ended up in the Pro Football HOF while Jackson's NFL career was cut short by injury. Centering on this copy is off a bit and maybe the edges on the back show some imperfections, but this card was a scratch the itch add to my PC - maybe the card will look different once in-hand, but maybe the most important consideration is the yellow space above the red bottom border looks fairly clean without smudging. As a manager, Molitor just got fired by the Minnesota Twins - but I’m trying to find a narrative as far as my recollections of him as an active player. Seeing a loose junk wax era card of his, I might have thought 'The Ignitor' was a minor star at best, winding down his playing career with the Milwaukee Brewers through the end of the 1980s - he had a 39-game hitting streak in 1987, but there wasn’t as much attachment to him as any kind of ‘real star’ when I first started collecting. With no particularly feelings attached to any particular player - I look at his numbers, how good he was, how many home runs hit, how high the batting average was and how many runners were driven in. I thought there might have been a pronounced decline of some sort in his 30s, but Molitor was quite productive - looking at his stats from 1988-1992, he was putting up ‘Paul Molitor numbers’ and played in over 150 games in all but one of those seasons for the Brewers. 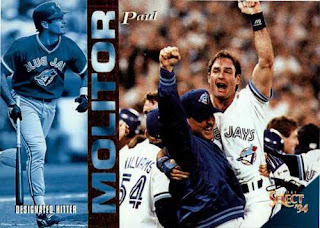 I noticed how he might have been a great player after all, because he was a hitting machine for the Toronto Blue Jays in the mid 1990s - the perennially contending Blue Jays finally won a championship in 1992 and in the organization’s defense of a World Series title, Molitor was another quality veteran added for repeat World Series championship run in 1993 [he was named MVP of the 1993 World Series]. 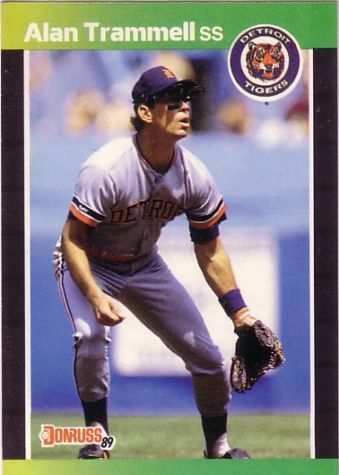 After waiting for quite a while, Trammell was finally inducted the Hall of Fame this past year - he played through 1996 but his last hurrah as a star player probably ended through the 1980s. As is, he was pretty familiar as a junk wax era guy - maybe it doesn’t mean anything at all but he was also pretty accommodating about signing, the times I’ve gotten him as a retired player, so he gets a thumbs up in my book. I'll always associate Davis with Angels teams of the late 1980s through the mid 1990s and picked this multiplayer card up to group with random Angels cards I may put together - he was a player who wielded a big stick and seemed like the last guy a pitcher wanted to go head-to-head with in a crucial game situation or frankly, in a brawl. Davis responded back, saying something like he had no regrets, since he was playing for the New York Yankees - he only played 35 games for the 114 win juggernaut 1998 team, but played in 146 games in his last MLB season in 1999. Unfortunately after one season, Davis was just fired by the Chicago Cubs as their hitting coach and his status in the major leagues is up in the air - whether a team is willing to offer him a job and if he is looking to continue coaching. I don’t want to get crazy with impulsive non-baseball card quarter box digs if I ever stop at a card shop - so I grabbed a few that caught my eye for a moment and added them to my other purchases of supplies, some other loose cards and several loose packs. 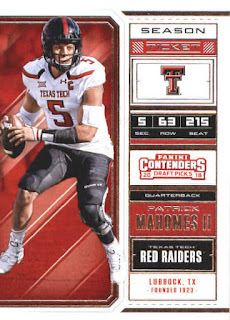 2018 Panini Contenders Draft Picks football Patrick Mahomes II #79 - though he threw two interceptions in his team's 30-14 win last Sunday, he's probably been one of the hyped up NFL players this season; if nothing else, in my bloodlines collection, I wanted to pair this card up with a card of his father Pat Mahomes, who was a former MLB pitcher. 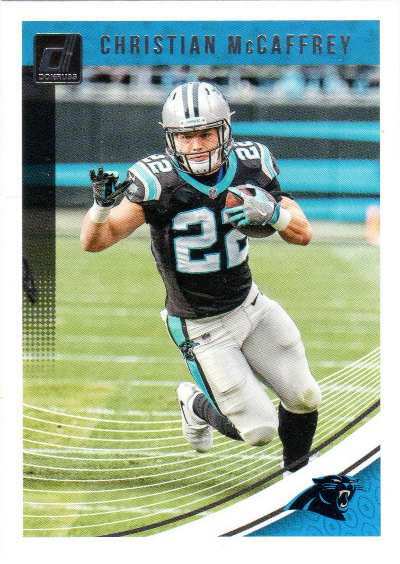 2018 Panini Donruss football Christian McCaffrey #22 - I had a random card of his father Ed, who played in the NFL during the 1990s, so I grabbed a card of Christian's to tie things up [for now] in my bloodlines collection. 2018 Panini Contenders Draft Picks football Adrian Peterson #4 - this card of longtime star running back can go to my beyond the glory collection or my infamous collection. I would probably inclined to go ‘beyond the glory’ since he has been through a lot in his football life, as well as personal life - in my world of mini-collection cards, there is no need to glorify the mistakes this pro athlete has made. 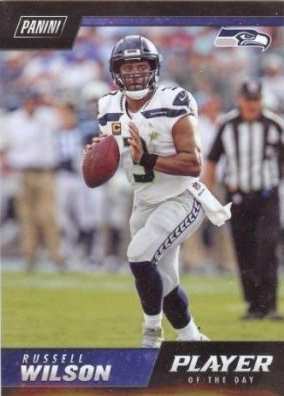 2018 Panini Player of the Day football Russell Wilson #36 - as the Seattle Seahawks teams around him as been torn down and rebuilt over the years, maybe the narrative surrounding his career has lost its luster. 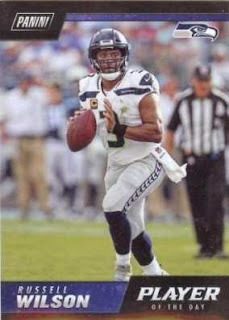 While Wilson has been singled out as a divisive figure in the locker room for any number of reasons - I still like the guy enough to pick up a card of his. 2018 Topps Heritage High Numbers 1969 Collector Cards Shohei Ohtani #69CC-SO [$4.99 BIN plus $1.00 s/h] - I've tried not to worry about the glut of Ohtani rookie year cards because it's just hard to really keep up, but this was a cutesy looking retail exclusive insert. I've still spent money on random card things, but felt like I’ve bought less retail blasters - it maybe the case where I don’t get a chance to get this card at all unless I get it outright. I may have paid a premium for this card, but maybe it evens out with how much it costs to have it shipped to me - that sounds stupid when I realize the card will probably be in a PWE, but it is what it is and I don’t mind as long as the card arrives safely. 2018 Topps Now Shohei Ohtani / Juan Soto AL / NL Rookies of the Month #824 [$4.95 BIN] - the final regular season Ohtani card through his rookie year, though there maybe a card for when he wins the American League Rookie of the Year award. I’ve kept up with just about every Topps Now Ohtani card released through his rookie season - a caveat is that no autographs or parallels perhaps, but those weren't realistic pickups for me. Maybe the cards will be nice to go back through - especially if Ohtani is still is on that dual pitcher / hitter track. Because it won’t be his rookie year anymore, I don’t think the plan is to get all the Topps Now Ohtani cards in 2019 - though I’ll keep an eye out for any ‘interesting’ ones.